All announcements and important messages from staff will be relayed to you through the internal myVanArts database: my.vanarts.com. Here you can also see your class schedule, grades and attendance. You should check this site daily for any important messages or communication from your instructors or VanArts admin. You can also send messages to your fellow students this way. It is your responsibility to keep your profile updated in terms of your mailing address, phone number and e-mail. If your contact information changes during or after the program, please edit your profile immediately. Please make sure your cell phones are turned off during class and especially during lectures. If you must have access to your phone for emergency reasons, notify your instructor ahead of time. Please encourage your friends and family to use your phone or e-mail if they urgently need to get in touch with you, as we are not able to pass along any messages given through the main VanArts office unless they are emergencies. For out-going calls there is a student phone outside of the lunchroom on the 6th floor. Please respect nearby classrooms when using the phone. You may use these phones for outgoing local calls only. Long distance calls can only be made with a calling card. VanArts offers internet access through the student’s personal work station, and there is also wi-fi access in the building. The purpose for this access is to provide students with learning resources and to give students the ability to research their respective industries. Unauthorized use of these computer resources may be grounds for dismissal. The following activities are considered unauthorized: downloading games; accessing and/or downloading from adult web sites; placing inappropriate (eg. pornographic, etc.) backgrounds on computer screens; continuous or excessive use of e-mail/messaging during class hours. At VanArts, we strive to create a professional atmosphere and expect all students to respect their classmates. Students should not abuse their internet access; it is very easy to fall prey to the lure of surfing the net all night long instead of doing course work. If you have any problems with your computer, send an email to IT Tech Support at: it@vanarts.com. All students have access to our internal servers for saving their work, but are also responsible for backing up all of their digital files on a regular basis. 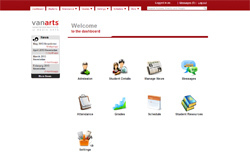 VanArts is not responsible for the loss of digital files that are not also backed up by individual students. For a personal student back-up plan, our IT Department recommends having 3 drives for school, travel and home use respectively. Mac users should make sure to format to be read by Windows. There is a networked photocopier/scanner/printer on the 6th floor behind the front lobby. You can also see Student Services or your Department Head for printing services.